A steel utility doors can be are easily installed as part of a room addition, garage makeover or barn. With properly sized framing, the pre-hung jambs will fit easily. With some care during the shimming, you can get a perfect close and good weather stripping seal. Once the shipping clips are removed, hold the door from swinging open when moving it in place. Do not push in corners flush to wall as this will force the door out of square with the jamb and cause gaps in the weather seal. Check to see that your door will easily fit within the opening. 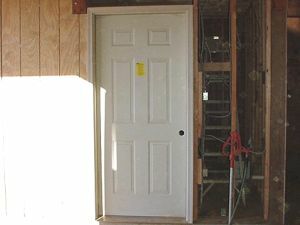 The opening should be at least 1/2" wider than the outer extent of the door jamb. The brick molding can be removed, depending on your installation. Remove the door clips. These hold the door tight for shipping. Carefully pry loose the plastic grips without damaging the door jamb. On the bottom of the door sill, pry loose the cardboard or wooden shipping skid. Be sure to pull any staples. To seal below the threshold, either caulk the base of the threshold or lay a sill barrier.